Harsh Narayan commenced his Sarangi recital with the enchanting melody raga Patdeep affiliated to “Kafi That”. The musical possibilities that were unleashed by the sarangi were discernible in the “alaap” and “vilambit” sections. Harsh’s “raagvistar” in the “vilambit teental gat” of the plaintive melody “Patdeep” conveyed ample depth of feeling. His multi-layered, textured “alap” which focused on the “badhat” of the raga in incremental progression added to the his presentation. His supple “meends and ghasitas” were graceful. In the faster “drut teen tal” composition, his dazzling, racy “taans” had remarkable clarity. Indian classical music is often a family affair. Ram Narayan was joined by his grandson Harsh Narayan, also on sarangi, who provided sensitive accompaniment, particularly in the slow, meditative opening sections of the ragas Patdeep and Shree. This was a musical interaction that fascinated and beguiled the audience. Harsh Narayan’s impeccable musical credentials were discernible in his rendition of Raga Saraswati. 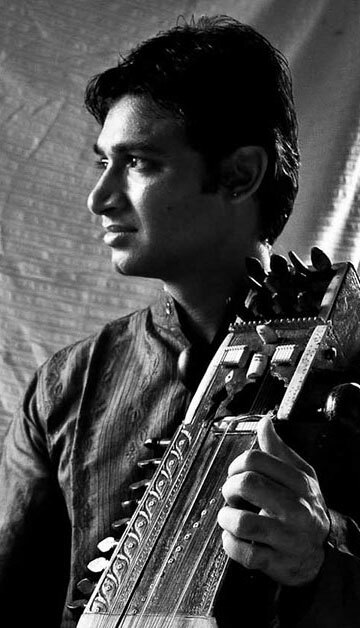 In his Raagvistar, Harsh Narayan transposed the mode of Khayal gayaki onto the Sarangi. The solemnity of this beautiful Carnatic Raga unfolded through unbroken sweeps of sound indicating a steady movement that gave his delineation its continuity and fullness. The ‘meends’ were supple and graceful. The composition in teen tal was followed by swift ‘taans’ in the drut teen tal piece.